Woodmont Doors FAX order form. Print this page from your browser. Use it for FAX or mail order quotes and orders. If you have more information to submit and you cannot fit it in the form above, please print ledgibly on a blank page and add your additional items. Such as plywood, mouldings, veneer, drawer boxes, hinges and any comments you may have regarding your order. Thanks. Make sure you include the first page too. 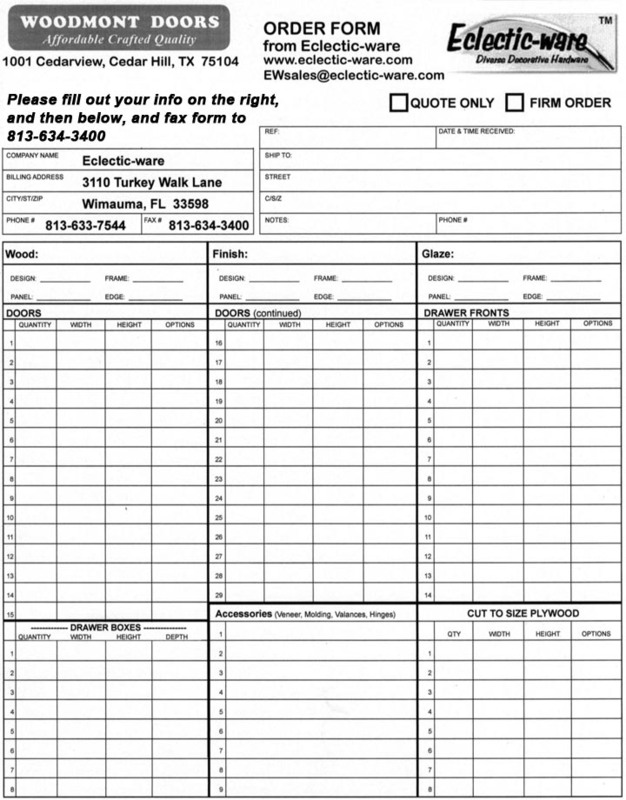 The form below can be used for Faxing us a door quotation request or a door order. RIGHT CLICK on the picture and then from the pop up menu, choose print picture. This will give you a better printout to use. If you need more room than this form permits, you can send us additional information on a plain piece of paper along with this form. And if ordering now, you can fax us your credit card info or call it in to us. It is best if we quote an order first, this way you will know the cost before ordering.